A Sikh pilgrim visits the shrine of their spiritual leader Guru Nanak Dev in Kartarpur, Pakistan (Nov. 28, 2018). It is no great claim to state that India and Pakistan have always struggled with the complexities that were established by the 1947 border. Instead of facilitating a separation, the partition persistently highlights the realities of a shared past, and continues to present new ways both countries seek to negotiate this dilemma. While an issue like the disputed territory of Kashmir can seem almost intractable, there are areas of shared interest between the two countries where they are capable (albeit stubbornly) of forming agreements, building trust, and making progress toward greater stability. One of many problematic outcomes of the 1947 partition of India — and its creation of Pakistan — was that a number of sites of religious significance to the region’s three main religions became located on either side of the division. This created a significant tension between the religious aspirations of the two countries’ citizens and the new hard border now placed in front of them. This became especially troublesome for followers of Sikhism. For Sikhs, the partition of India posed a deep existential headache. Sikhs overwhelmingly chose India over the newly formed Pakistan as the state that would best protect their interests (there remain around 20,000 Sikhs living in Pakistan today, compared to around 21 million in India). However, in making this choice Sikhs became isolated from a number of their holiest sites, as well as their cultural, and former political, capital of Lahore. This has generated a westward yearning for the community that the border only intensifies. While the Sri Harmandir Sahib (or Golden Temple) in the Indian city of Amritsar remains Sikhism’s most important religious site, three sites (gurdwaras) deeply connected to the life of the religion’s founder, Guru Nanak, are now in Pakistan. The Gurdwara Janam Asthan, west of Lahore, is situated on the location where Guru Nanak was born, and the Gurdwara Panja Sahib in the town of Hasan Abdal is believed to have the handprint of Guru Nanak imprinted on a boulder within its grounds. And lying just 4 kilometers across border is the Gurdwara Darbar Kartarpur Sahib, the location of Guru Nanak’s death, and where he spent the last 18 years of his life. Such is the emotional pull of this site that on the Indian side of the border a viewing platform has been constructed where people can use binoculars to gain a look at the temple. India and Pakistani do have an agreement that provides a framework to approach this dilemma. The Protocol on Visits to Religious Shrines (1974) allows their respective citizens the opportunity to visit religious shrines in each country under certain conditions. Alongside Sikhism’s holy sites in Pakistan, India contains a number of sites of great importance to followers of the Sufi Islam, while Pakistani Hindus and Indian Muslims also rely on the protocol for their cross-border pilgrimages. The protocol recognizes the deep shared history that permeates the region, and understands that the cultural and religious requirements of their respective citizens need to be honored outside the strategic animosity between the two states. However, the agreement is often held hostage to this animosity. When tensions arise both states become reluctant to issue visas to pilgrims, creating further resentment and suspicion between the countries. Yet a recent initiative, instigated by the new Pakistani government of Imran Khan, to establish more consistent access for Sikh pilgrims has the potential to build some greater trust between the two countries. With the Gurdwara Darbar Kartarpur Sahib being so close to the border, its location presented an opportunity to create a more efficient structure around visitation rights, and provide some surety for Sikh pilgrimages. In late November inauguration ceremonies were held for a new road linking the Indian town of Dera Baba Nanak to the Gurdwara Darbar Kartarpur Sahib in Pakistan. Known as the “Kartarpur Corridor,” the road would allow for visa-free travel for Sikh pilgrims to the gurdwara. It is planned to be opened next year, in time for the anniversary celebrations commemorating 550 years since Guru Nanak’s birth. Although the plans for the corridor include a fenced roadway, creating something of a inhospitable environment for the short journey, the development will nonetheless be appreciated by Indian Sikhs, and the display of cooperation between Islamabad and New Delhi should be taken as a positive step. Khan’s initiative, combined with an announcement that Pakistan would issue 3,800 visas for Sikh pilgrims to visit other sites in Pakistan for Guru Nanak’s birth anniversary, seems to indicate a greater willingness to reach out to India. These actions can be seen in light of what has come to be known at the “Bajwa Doctrine.” Earlier in the year, Pakistan’s army chief General Qamar Javed Bajwa, made a series of speeches signalling that Pakistan was willing to take a more cooperative approach to its neighborhood relations. The analytical consensus was that a stalling Pakistani economy has the potential to become an internal security threat, and Bajwa sees that increasing trade with India may provide a solution to this problem. While New Delhi may welcome this more conciliatory tone from the Pakistani military commander (the driving force of Pakistani foreign policy), it will also be wary that the Bajwa Doctrine itself faces a highly institutionalized combative attitude toward Pakistan’s neighbors that may be difficult to shift so easily, even with the Pakistani military’s considerable influence on public policy. Although Bajwa and Khan may be attempting to find a more cooperative relationship with New Delhi, Pakistan’s national psychology remains focused on proving that the idea of India, as a plural and secular society, cannot work. Pakistan was indeed born out of this notion, making it a deep existential component of the state. Due to this Islamabad has a tendency to find ways to try and intensify sensitive internal issues to annoy the Indian government. In April, a group of Indian Sikh pilgrims were granted visas to visit the Gurdwara Panja Sahib in Hasan Abdal for Vaisakhi, Sikhism’s most important festival. However, along the route to the town Sikh separatist propaganda had been strategically placed. The posters proclaimed “Sikh Referendum: 2020 Khalistan” — a reference to a proposed referendum by the New York-based Sikhs for Justice for a separate Sikh state to be known as Khalistan. The advocated poll has no support from either the Indian government or the Punjab state government, and it seems to lack any credible way of gauging actual separatist sentiment with its focus on diaspora communities. But for Pakistan the noise presented an opportunity to try sow discontent among the Sikh pilgrims visiting their religious site. India has long accused Pakistan of attempting to ferment separatist sentiment in Indian Punjab, and the leadership of Babbar Khalsa International (BKI) — the Sikh terrorist organization responsible for the bombing of an Air India flight from Toronto to Delhi in 1985 — is currently located in Pakistan. According to the South Asia Terrorism Portal, the organization is aided by Pakistan’s Inter-Services Intelligence (ISI), as well as by Sikh diaspora groups. Were Pakistan to utilize such tactics again in relation to the Kartarpur Corridor the initiative would quickly be derailed. But as a new prime minister, Khan should be given time to demonstrate he is indeed sincere in wishing to make progress on the relationship with India (he wasn’t yet PM in April). However, Bajwa must understand that antagonistic actions like displaying Khalistani propaganda will only undermine his new strategic doctrine. That Bajwa was seen shaking hands with a pro-Khalistan leader at the groundbreaking ceremony for the corridor did not bode well in this regard. If Pakistan is genuine about its current outreach toward New Delhi then its leaders will require greater vigilance and restraint in order to establish the requisite trust. Currently that trust is lacking. Swaraj has indicated that she sees the positive developments regarding the Kartarpur Corridor as separate from the wider bilateral talks between the two countries — the latter being something that New Delhi is currently refusing to re-engage with due to continued Pakistani efforts to further destabilize India’s Kashmir region. With an election approaching in India, Prime Minister Narendra Modi would also be cautious about engaging in any complex and protracted negotiations. Modi will also not attend the South Asian Association for Regional Cooperation (SAARC) summit to be held in Islamabad this month. As is the case with such a diverse and complex region, a potential solution to one problem usually has the knock-on effect of generating another problem. 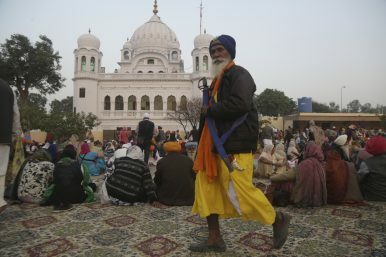 The smoother access to the Gurdwara Darbar Kartarpur Sahib for Indian Sikhs has already created demand from other religious groups for similar arrangements. Hindu Kashmiri Pandits are now hoping to gain easier access to the Sharada Peeth temple, which lies across the Line of Control (LoC) in Pakistan-administered Kashmir. Given the sensitivity of the region, this seems highly unlikely. In this light, what the development of the Kartarpur Corridor has clearly demonstrated is that the deep shared cultural and religious histories of the region cannot be erased, only complicated by the border. It remains true that at the time of partition it was not fully understood exactly what the new border would produce. After all, Muhammad Ali Jinnah — the driving force of partition and founder of Pakistan — thought he’d be able to retire in Bombay (now Mumbai), a prospect that may have seemed plausible to him at the time, but is clearly absurd today. The Kartarpur Corridor may be a small initiative to create some goodwill and ease one pressure on both states, and with success this may create the momentum to identify and sooth another problem in the future. Although religious tensions in the region continue to be fraught, the opportunity for more consistent and efficient access to pilgrimage sites is an area of cooperation between the two states that could prove fruitful. With increased trust and serious commitment this incremental approach may achieve some tangible results, but the overall task of rapprochement remains considerable. Grant Wyeth is a Melbourne-based political analyst who writes on international affairs for the Diplomat. He tweets @grantwyeth.